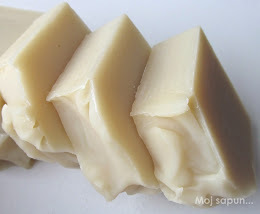 Мој сапун...: SenMi Soaps: Welcome Again! It was confirmed so many times until now that soapmaking is not only designing and making soaps but, following soap related blogs, also opportunity to find out and meet interesting people. Can you imagine how I felt coming late from the office on Friday afternoon, exhausted from the past week, when I saw the parcel? I was more than delighted since it took only three days for it to be delivered from Nederland to Serbia! 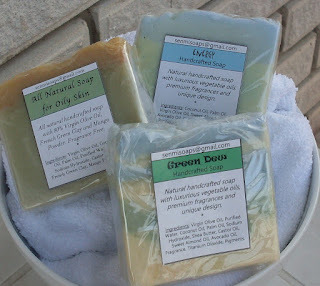 It was difficult for me which soaps to choose since SenMi has really grate portfolio but finally I made my mind: “Energy”, “All Natural Soap for Oily Skin” and “Green Dew”. But there were also surprises waiting for me in the parcel. 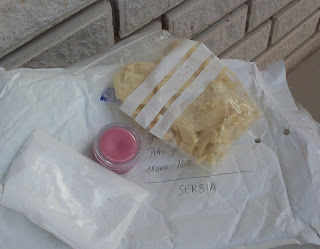 Ksenija sent lip balm (immediately taken by my daughter) and to ingredients which were very difficult for me to find (cocoa butter and TD). What can I say finally? Ksenija, thank you a lot and looking forward to welcoming your soaps again!!! Dear Ksenija, it was real pleasure for me! Great place to speak a word about Xenia! Last year I was desperately searching internet and looking for some advice in my endless search for relevant sites,literature, suppliers,etc. I need to say that Xenia was almost one ( the other one available for sharing was actually a soapmaking manufacturer who my sister had spoken first with,so it doesn't count) who replied me. Even at the moments I thought I she wouldn't,because she had fed up with my questions. Probably there is no appropriate word to describe how much that meant to me. I will say that I didn't choose to write to her randomly,I'd liked so much her soaps and everything she had posted about,that was almost unreal when first mail of hers arrived. Extraordinary artist (she is multiple talented) and extraordinary person. If she was closer,I would like her as a friend,too. At last,not the least, she was that link to get me and the owner of this blog together,so I'm happy to have these two great persons in my soapmaking adventures and,why not say,in life! I am blushing... Thanks! I hope that the three of us will meet one day in person! Dear Maja,thank you a lot for your comment! Xenia,two of us already have,hopefully we make it three one day. Goco,it's always my pleasure to comment cos I look forward to reading and seeing your news!